The Fall 2017 Merienda Speaker Series continues the tradition of showcasing speakers from KU who work and research in Latina/o communities in the United States, as well as Latin American and Caribbean countries, from diverse programs such as business, Spanish and Portuguese, art and design, and anthropology. 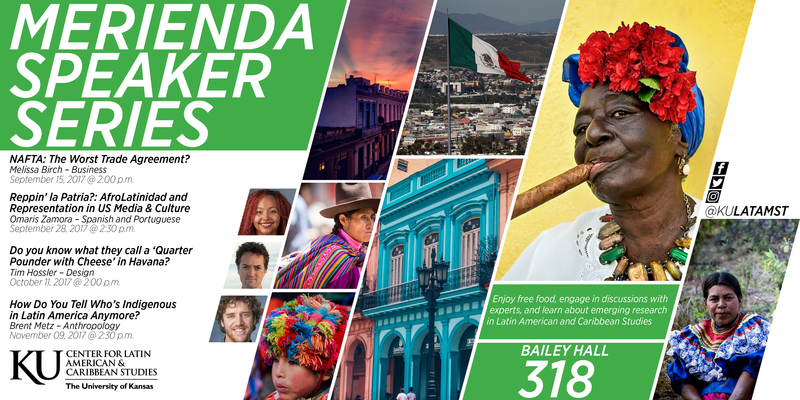 All of the Meriendas will be held in Bailey Hall Room 318, with free food and refreshments provided. For Merienda photos, please see our event photos. September 15 - Melissa Birch, Business. "NAFTA: The Worst Trade Agreement?" Watch Video. September 28 - Omaris Zamora, Spanish and Portuguese. "Reppin' la Patria? : AfroLatinidad & Representation in US Media & Culture." Watch Video. October 11 - Tim Hossler, Art & Design. "Do you know what they call a Quarter Pounder with Cheese in Havana?" Watch Video. November 9 - Brent Metz, Anthropology. "How Do You Tell Who’s Indigenous in Latin America Anymore?" Watch Video. January 19 - Laura Herlihy, CLACS. "The New Colonization of Nicaragua’s Caribbean Coast." Watch Video. February 9 - Paula Cupertino, Preventative Medicine and Public Health, KUMC. “Optimizing Treatment for Smoking Cessation in Kansas, Mexico, and Brazil.” Watch Video. March 2 - Clara Irazábal Zurita, Architecture, Urban Planning, and Design, UMKC. "Housing Brazil's Precariat: Social Movements and Restorative Justice." Watch Video. April 6 - Viviana Grieco, History, UMKC. "Francisco de Paula Sanz. Image, Emotions, and Power." Watch Video. September 8 - Randy David, Anthropology. "Correlates of Chikungunya infection and transmission in Santo Domingo, Dominican Republic." Watch Video. October 19 - Bob Augelli, Business. “Business and Culture in Cuba” Watch Video. November 3 - Chris Brown, Geography and Environmental Studies. "A year living and working in Brazil." Watch Video. December 8 - Phillip Duncan, Linguistics. "Patterns of case and agreement in Me'phaa." Watch Video. February 12 - Will Penner and Silvia Sánchez-Díaz. "Sustainable Development in rural Guatemala"
February 19 - Mugur Geana. "Knowledge, barriers to prevention, and sources of information about dengue in rural Costa Rica." February 26 - Brett Bias. "Good Catholics, Bad Behavior: The Role of Sacrilege and Blasphemy in the Lived Religion of Colonial Mexico." March 25 - Stand Herd. “Earthworks and the Olympics: Making ‘Young Woman of Brazil.’"
April 1 David Cooper. "Whose Water? Whose Rights? A Comparative Analysis of Conflicts over National Water Policy in Ecuador and Peru." April 15 - Steve Scott, "The religious, social, and musical characteristics of Festa de São João (St. John’s Festival) for the Indigenous Xucuru tribe of Northern Brazil." April 22 - Cécile Accilien. "TBA." April 29 - Nate Frieburger. "TBA." March 5 - M'Balia Thomas, "Globalization, the Cultural Imaginary, and the Challenge to Promote and Diversify U.S. Study Abroad."